Christmas is December 25. Many people celebrate the holiday around the world with special food, music and gift exchanges. But the holiday can also be very busy and difficult. Sometimes it is hard to get into the spirit of Christmas. What can you do? Nothing spreads good cheer better than helping others. Start a holiday tradition with Random Acts of Christmas Kindness, or RACK. RACKing does not have to be costly; the best gifts are often those that take the most thought and no money at all. For inspiration, check out ​Pinterest RACK boards and RACK pins. This RACK Pinterest board has pins including RACKS for the elderly, kids and more. Also check out RACK webpages to get ideas for helping others. Baton RougeMoms.com has one. Another, the Still Being Molly website, has a free RACK Advent calendar to download. The calendar is filled with ideas to spread cheer: RACK Advent Calendar 2016. And, the Kiddie Matters website has 30 ideas for random acts of kindness you can do with children. Real estate website Zillow has a virtual tour of Santa's house at the North Pole. Head to Santa's House on Zillow and click on the video to see where Santa lives. The page includes information that can be found on Zillow pages about real houses, like age and number of rooms. You can also look at photos of the inside. Santa's house is not for sale, but you can still take the tour! Holiday music can get you in a jolly spirit. The Christmas Radio app can help you find seasonal songs. You can choose tunes from more than 100 Internet radio stations and add favorites to your Spotify playlists. The app also lets you choose favorite themes and background colors. Fall asleep to Christmas music with the sleep timer. Music genres include Christmas Pop, Rock, Classical, Instrumental, Jazz and Smooth. The app is free with in-app purchases available. Christmas Radio is available in the Google Play store. The World Radio Stations Christmas iPhone and iPad App is a free app that broadcasts in ten languages from 97 radio stations around the world. Search for music by language or by genre, such as jazz, classical or music for children. World Radio Stations Christmas is available in the iTunes App Store. Spotify is filled with Christmas playlists. Search for "Christmas music" to find playlists or create your own. Each year the PNP website lets users create a free video with their gift wish lists for Santa. The videos are fun for children and adults. They can include the name of the person, the gift they want, photos, and whether they have been naughty or nice. Head to the PNP website to create a Santa video or download the PNP Santa app to create a video from a phone or tablet. To create the video, add a photo of yourself or someone else. Then add information about what you or they would like as a Christmas present. PNP will use it to create a personal video for free in just about one minute. After you create a video you can share it with others via Facebook and email. Fans of Christmas and Facebook stickers will enjoy adding Christmas stickers to their Facebook messages. 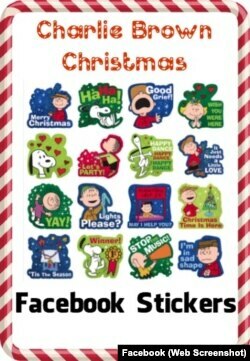 Add stickers such as Charlie Brown Christmas to messages you send on the Facebook website or in the Messenger app. Use the free stickers in Facebook messages to help your friends find the holiday spirit themselves! I’m Dorothy Gundy. And I’m Rick Hindman. Do you use tech to get into the holiday spirit? Have you tried any of these websites, apps or other tech tools? Do you have any holiday tech you recommend? Share your thoughts in the Comments Section below or on our Facebook page. naughty - adj. behaving badly — used especially to describe a child who does not behave properly or obey a parent, teacher, etc.